In Sierra Leone, where commercial small-scale aquaculture is in its infancy, FISH is developing and testing participatory extension approaches to encourage interested farmers to begin fish farming as part of profit-oriented businesses. Small-scale aquaculture has significant potential to diversify livelihoods, raise incomes and create employment opportunities as well as improve household food security through greater access to fresh, nutritious fish. Despite these benefits, few farmers in Sierra Leone are currently engaged in aquaculture, mainly because the concept of fish farming for business is relatively new in the country. As part of its efforts to support the development of the national aquaculture sector, the USAID-funded Feed the Future Scaling Up Aquaculture Production (SAP) project is developing and testing participatory extension approaches designed to give farmers the skills and knowledge they need to operate profitable aquaculture businesses. The focus of the project, which runs until 2019, is the inland Tonkolili District, one of the poorest and most nutritionally insecure regions in the country. Farmers like Abu Kargbo are a vital link in the extension service chain. Abu started working with the project in 2015 during a pilot on integrated agriculture-aquaculture systems. He is now a lead farmer in a fish farming cluster in Kamathor community. In March 2018, he harvested over 151 kilograms of fish from his 600 m2 pond. He reserved 15 kg for household consumption and sold 136 kg, earning a total of 1,230,000 Sierra Leonean leones (about USD 146). With the profit, he was able to repay a loan he had taken out to purchase inputs to feed his fish and manage the water quality in his pond. Aside from Abu, there are four other extension farmers in the SAP project who voluntarily share their knowledge and experience with other farmers, helping them to identify suitable pond sites and teaching them good pond management practices and business skills. “There is a need to increase the number of ponds in our community if we want to scale up aquaculture, increase fish supply and improve nutrition. So, I also want other people to learn about and benefit from fish farming technologies to make it sustainable,” Abu says. Thanks to his efforts, 25 farmers (7 women and 18 men) in Kamathor, Basia, Kaningba and Yiben communities have stocked their ponds with tilapia fingerlings. Before the SAP project, fish farmers in Sierra Leone, particularly in inland areas, had no access to extension services. Of the extension approaches tested to date, research suggests that the most successful learning occurs at the pond site. Through exchange visits facilitated by the project, new and interested farmers are able to observe the construction of fishponds, receive assistance in farm management, ask questions and hear about challenges and successes from their peers. Jeremiah Janjuma, one of the lead farmers in Bumbuna community, stocked his first pond with tilapia fingerlings in August 2017 and has already shared his progress other farmers. In his 500 m2 pond, he produced 137 kg of fish. He sold 117 kg of that and earned 700,000 leones (USD 43). He reserved the remaining 20 kg for household consumption. By September 2017, 92 out of 147 farmers from 10 cluster groups had stocked their ponds with tilapia fingerlings. Over the next three years, the project aims to increase the number of clusters from 10 to 45, and the number of fish farmers in clusters from 147 to 1125, each farmer with at least one pond. Sustained attention to creating an enabling environment for farmer-to-farmer learning and equipping farmers with the skills and knowledge to run businesses will ensure that long-term benefits are maintained and scaled up beyond the duration of the project. 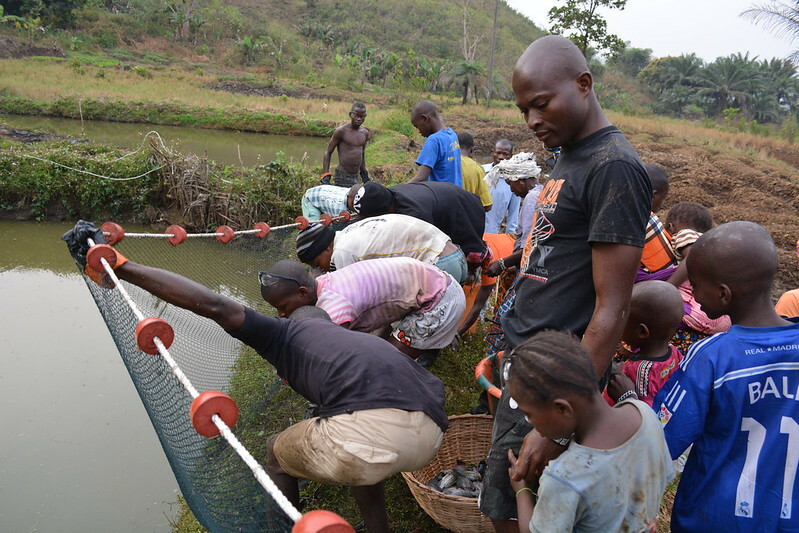 In addition, the willingness of lead farmers to act as community extension workers and spearhead the adoption of better farming techniques through training sessions and knowledge sharing holds the promise of transforming the aquaculture sector in Sierra Leone.